The answer depends on how much risk you're willing to take on. Owning precious metals stocks can help diversify a portfolio. But how you go about buying this exposure can make a big difference to how well you sleep at night. For example, which is the better buy: Silver Wheaton (NYSE: SLW) or Hecla Mining (NYSE: HL)? The answer is complicated. Hecla Mining is your typical miner. It gets its hands dirty digging up gold (40% or so of revenue), silver (about 30%), lead (a touch over 10%), and zinc (nearly 20%). That's not a bad mix, with precious metals providing the core of the business. And Hecla is largely a North American miner, which means you avoid countries with less agreeable governments and weak regulatory controls. What you can't avoid is the complication of owning and operating mines. To be fair, Hecla's costs are fairly low, once you consider the offsetting revenue from byproducts. The company reports that its cash costs for silver in 2015 were $5.85 an ounce; for gold, the figure was around $775 an ounce. That's well below where silver and gold are trading today. Hecla is also investing in the future with a number projects set to come on line this year and next, with some longer-term projects in the wings. The problem with this is that Hecla's top and bottom lines have been hit by the low prices silver and gold have fetched in recent years. It's lost money in two of the last five years, including in 2015. That makes growing in the downturn a little more of a financial risk. 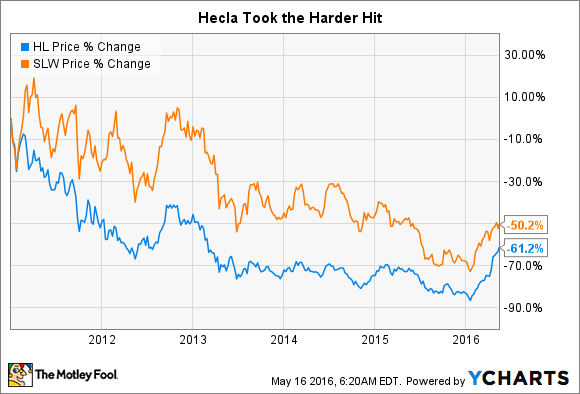 With a 125 year history and long-term debt at a touch under 30% of the capital structure, it's likely Hecla will survive this downturn like it has so many others before. But what if there's a different option for investors? The streaming cycle. Image source: Silver Wheaton. That's where a company like Silver Wheaton comes into play. Silver Wheaton is what's known as a streaming company. It provides upfront payments to miners like Hecla for the right to buy silver and gold at reduced prices in the future. It's kind of like a specialty finance company that gets paid in silver and gold. Unlike a miner that has to actually work to keep its costs down, Silver Wheaton's costs are stipulated by a contract. It currently pays around $4 an ounce for silver and $400 an ounce for gold. That's even better than Hecla's cash costs. For reference, silver is about 60% of Silver Wheaton's portfolio and gold 40%. And while Hecla has kept on investing through the downturn to increase production over the long term, so has Silver Wheaton. Only Silver Wheaton does it a different way, without all the hard work of finding and developing mine projects. Silver Wheaton uses short-term financing, like bank loans, to ink streaming deals with miners and then sells stock to permanently fund the investment. This downturn has been a great opportunity for Silver Wheaton, allowing it to ink $1.8 billion worth of streaming deals last year alone. You can't avoid the risk of often-volatile precious metals prices with either of these companies. And while both Silver Wheaton and Hecla are hitting production records, Silver Wheaton has done it with a lot less physical work and business risk. This isn't a trivial issue, because it shows up in the stock price. At its nadir in January 2016, Hecla's shares were down around 85% from where they started 2011 (when the current commodity downturn started). The low point for Silver Wheaton's shares was around 70% down. Hecla shareholders felt more pain. A 15-percentage-point difference may not sound like much, but it is a big deal -- it's a 20% larger loss. That said, with less downside pain, there's also been less upside gain. Since the middle of January, Hecla's shares are up around 170%, and Silver Wheaton's shares are up "only" 70% or so. Go back to 2011, however, and Silver Wheaton's shares are still the better performer, down about 50% versus Hecla's 60% even after the price rally. So which is the better stock? It depends on you. If you are looking to invest in a gold and silver company while keeping risk at a minimum, Silver Wheaton's sound business model is probably the way to go. If you think silver and gold are headed for bigger gains, then Hecla will likely provide you with more upside, with portfolio diversification and well-located mines thrown in for good luck. But choose wisely, because silver and gold prices are unpredictable, and you might find out the hard way that your risk tolerance isn't what you thought it was.